Who would have thought that our KFC fried chicken would be an object of desire in Japan? But perhaps all it takes is some very good PR (and some luck), and a product designed to please a very specific audience finds a new user group… Kentucky Fried Chicken for Christmas Dinner Japanese tradition started in 1974. While Japan is not a Christian nation — most Japanese (84% to 96%) identify themselves as Shinto or Buddhists — people do celebrate Christmas. There are Christmas office parties, people put up trees and give gifts, and families and friends eat Christmas dinners together. But unlike here in U.S., Christmas turkey dinners are not common — it is almost impossible to get a turkey at a local supermarket. 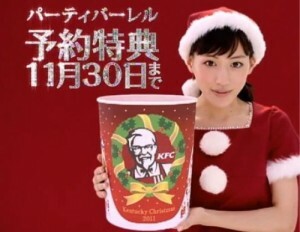 To celebrate the Christmas spirit with an authentic American flavor, Japanese turn to KFC! The Kurisumasu ni wa kentakkii — or Kentucky for Christmas — is so popular, that people have to order their Christmas fried chicken buckets a month in advance! This is the power of advertising. The new generation will grow up with Siri: What will this mean to their expectations of how devices should/could work? What are the implications to product design and interaction design? Tugend, A., (2011). “It’s Just Fine to Make Mistakes.” NYTimes.com. Visited on October 8, 2012: http://www.nytimes.com/2011/03/12/your-money/12shortcuts.html Experiment: A study was conducted comparing the productive abilities of participants testing high and low in “perfectionism”. The task was to rephrase a passage without interpretation for a panel of judges who were unaware of the status of the participants. The Outcome: Those rating high in perfectionism were judged to have passages “significantly poorer in quality”. This surprising finding can be attributed to a shortened process of learning in perfectionists, due to fear of failure and the loss of respect should a mistake be found. This isolation from feedback inhibits development. Additionally, the stress of perfectionism can be psychologically detrimental, further inhibiting learning especially in the face of failure. Interaction Design: For products with a high learning curve, built-in feedback could be considered when the product is not used as designed, and alternately when ideal conditions of usage are met. This would perhaps encourage experimentation and calibrate use. Interface Design: Friendly tone or customizable interface might also help to attract continued use. This could give perfectionists and non-perfectionists a positive working arena.